Been trying to decide how to better cool my FX-8350. I'm currently using the water cooler setup in my sig. I've looked at waterchilling and phase change but really don't have the room for them. I used a watt calculator to determine that my chip will use 230 watts at the speed I hope to attain. Is there a 50mm TEC that will cool my chip? I do have a variable PS that will do up to 30A@24V continuous. It's a long time since I played with TECs, but if I'm remembering my formulas right almost certainly the answer is 'no'. Long answer is 'maybe' depending on how much money you want to spend. You say your 8350 will use 230W. I'm presuming that's power draw, heat output will be different. Let's call it 300W max heat output to be on the safe side. Common specs for 50mm TECs are ~430W, DTMax of ~69 degrees Celcius. Some math: delta T = (1 - (Estimate heat load / maximum TEC rating)) * DTMax. Or, in this case, (1-(300/430))*69; = 20.86 degrees Celcius. If we assume your 230W figure, this gets a delta T of about 32 degrees. So operating a typical 50mm TEC at maximum output on an estimated 300W heatload will produce a temperature differential between cold side and hot side of 21ish degrees. You now have to work out what your hot-side temp will be at. Presuming /nothing else/ in your loop is producing heat, you now have a total heat-dump of (CPU output) + (TEC output) - or ~300 + ~430 = ~730W. That's about enough to heat a litre of water by about 12 deg C every minute. Martin did a review of your radiator some time ago, and from looking at those charts the heat dissipation capacity for a 10 deg C difference between ambient and water temps is about 380W using 2200RPM fans. I don't know what fans you're using, but unless you're relying on industrial screamers, your current loop won't be able to handle even half these tentative numbers to produce a CPU temp only ~11 degrees C below your current ambient (fluid 10C hotter than ambient - 21ish hot/cold difference of TEC), or ~22 below ambient if we use the 230W figure. Again, it's been a while, so my numbers could be wrong, but I really don't think you're going to get your desired outcome using a single 50mm TEC. Last edited by SoulsCollective; 08-23-2014 at 07:46 PM. Will not chill sub 0 all 8 cores beyond 3ghz and 1.164v. I've tried it. But was trying to keep frozen. Will not cool 8 cores beyond stock with cool and quiet on and long heavy load duration will over come the TEC in a matter of minutes. Cut core count on FX-8350 and be able to OC. 4 cores enabled get you around 4.2ghz frozen, up to 4.6ghz above zero temps. 2 cores would go 5ghz++ sub zero good for benchmarking. There's a thread out there somewhere with some testing I'd done. Assume half core = half power = max 150W heat load. It's not going to be linear, for sure, but just for proof of concept: delta T = (1 - (150 / 430)) * 69; dT = 44.9 dec C. Difference between cold and hot side therefore 45 deg C, potential coldside difference below ambient 35 deg C assuming radiator fluid 10 deg C above ambient. Total heat dump your loop's going to have to handle at about 580W, so more than your current loop's capacity (depending on what fans) but not enormously so. So, unless you live somewhere really hot, for sure disabling half cores could get you below zero. But I don't see much point owning an octocore and disabling half the cores. Right disabling half the cores is no fun. But the quad core AMD cpu is 125w and 95w respectively. Better results would obviously come from a 8 series chip. For the sake of fun, it's a good challenge. For daily purposes, not so much. 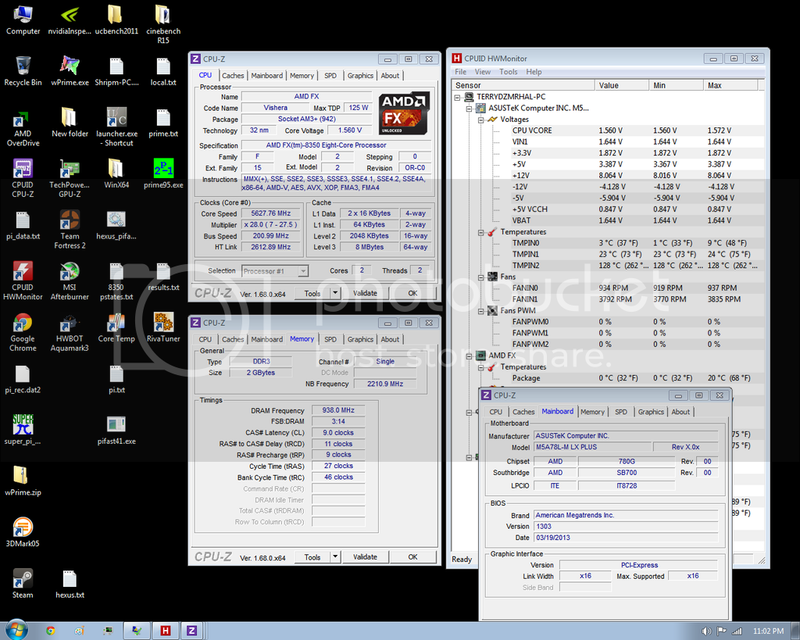 Here's 2 cores FX-4300 - 5.4ghz @ 1.5v TEC cooled. And this next one is about as far as I could get the Cpu to go. 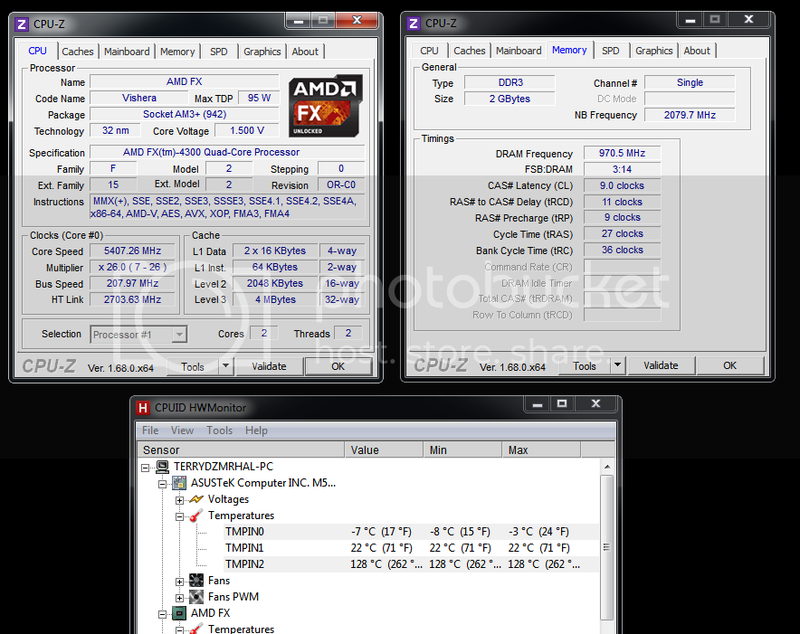 2 cores FX-8350 5627.76Mhz @ 1.560v and started going positive above zero temps. Yea this was much better than what my water loop by itself could accomplish. The cpu likes the cold temperatures vs the voltage. I realized the total thermal output would be high but not that high. I'd like to try to get this thing up to 5.5Ghz 24/7. I think I'l just work on adding my GPU to my loop for the now. Thanks for your math and input guys. TECs are fun but horribly inefficient. For modern CPU heat outputs, using them in the old-fashioned 'strap coldside to chip and rock on' way is highly sub-optimal - however they get a lot more efficient when under-volted and used in series to set up a waterchiller or 'cold loop'/'hot loop'. What you're looking for is a high CoP ('coefficient of performance') - basically, how much energy is 'wasted' in the form of heat-dump to 'remove' a certain amount of thermal energy from the cold-side. Running at maximum voltage CoP is very, very low - 0.3 or less, which produces what you see above - massive heat dump. Running at something like 5V the 'amount' of heat 'pumped' from cold side to hot side is in absolute terms much less, but the amount of excess heat produced to do it similarly drops. Ideally, and what I was referring to in my first response when I said 'maybe', you would run 4+ TECs sandwiched between two loops, but this becomes bulky and expensive. Ultimately, TECs are toys - fun, but if you're serious about getting high OCs at sub-zero temps then phase-change is basically your only space efficient option. With unlimited space and money, you can get some rather viable waterchiller scenarios using them, but total cost of ownership approaches or even exceeds the cost of a good custom phase unit.